Looking for some summer dining inspiration? Then look no further! We are sharing three of our favourite go-to recipes that will be sure to impress your friends and family. The key is to keep things simple, but super tasty. "This is a fresh and light salad that makes an ideal supper in the evening sun." 2. Meanwhile, cook the garden peas in boiling water for 2 minutes then drain. 3. Toss the courgettes and peas together. Squeeze in the lemon juice and crushed mint and toss into the salad. 4. Sprinkle with sunflower seeds and pine nuts. Serve with some warm crusty bread if you wish! Featuring our Dew Drop Ceramic Small Serving Bowl. 1. Sift 225g plain flour into a large bowl, add 100g diced butter at room temperature and rub in with your fingertips until the mixture resembles fine breadcrumbs. 2. Stir in a pinch of salt, then add 2-3 tbsp water and mix to a firm dough. Knead the dough briefly and gently on a floured surface. Wrap in cling film and chill for 15mins. Roll out and place in a flan tray or like us keep it rustic in an enamel dish. 1. Crumble the feta on the bottom of the short crust pastry. 2. Pour olive oil into the saucepan and when it's heated, throw in the spinach and cook until wilted. Once wilted, place evenly on top of the feta and pastry. 3. Beat eggs, garlic and creme fraiche together. Pour over the top of the spinach. 4. Sprinkle a handful of cut chives onto the quiche and add chopped plum tomatoes. 5. Place in 180ºC oven, gas mark 4 and cook for 45mins until lightly set. 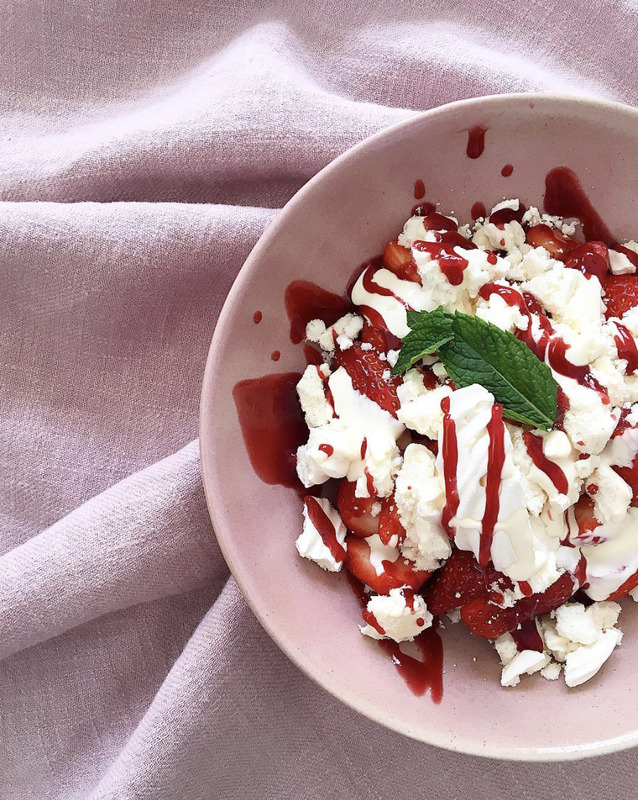 "Eton mess is such a classic old-school dessert and it's one of our favourite summer desserts!" 1. Heat oven to 120ºC, gas mark 1 and line a large baking tray with parchment paper. Whisk the egg whites in a clean bowl using an electric whisk or tabletop mixer until they reach stiff peaks, then add the sugar in 3 lots, re-whisking to stiff peaks every time. Spoon dollops of the mixture onto the baking parchment, cook on the bottom shelf of the oven for 1hr - 1hr15 mins until the meringues are completely hard and come off the paper easily. Leave to cool. 2. Blitz 1/3 of the strawberries to make a strawberry sauce. In a large bowl whisk the cream with the icing sugar until it just holds its shape. Roughly crush ¾ of the meringues and tip them in with the chopped strawberries and raspberries and stir. 3. Dollop into bowls then crush the remaining meringues, sprinkling the pieces over the top. Finally, drizzle on the strawberry sauce. Featuring our Beetroot Organic Bowl and Rosa Linen Napkin. Did you know our Scandinavian style blankets are perfect for using as a picnic blanket? Best of all, they’re stain resistant, easy to clean and a great choice for those with children, pets... or just a habit of spilling wine!